(U//FOUO) Terrorists overseas have suggested conducting vehicle ramming attacks—using modified or unmodified vehicles—against crowds, buildings, and other vehicles. Such attacks could be used to target locations where large numbers of people congregate, including sporting events, entertainment venues, or shopping centers. 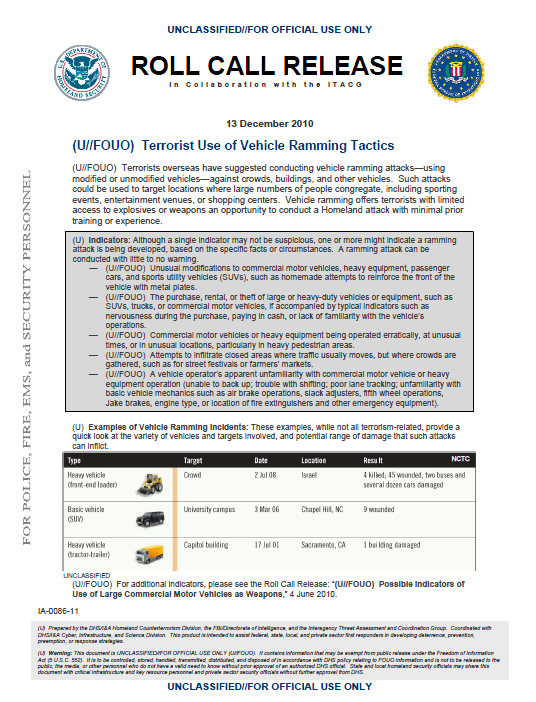 Vehicle ramming offers terrorists with limited access to explosives or weapons an opportunity to conduct a Homeland attack with minimal prior training or experience. (U) Indicators: Although a single indicator may not be suspicious, one or more might indicate a ramming attack is being developed, based on the specific facts or circumstances. A ramming attack can be conducted with little to no warning. (U//FOUO) Unusual modifications to commercial motor vehicles, heavy equipment, passenger cars, and sports utility vehicles (SUVs), such as homemade attempts to reinforce the front of the vehicle with metal plates. (U//FOUO) The purchase, rental, or theft of large or heavy-duty vehicles or equipment, such as SUVs, trucks, or commercial motor vehicles, if accompanied by typical indicators such as nervousness during the purchase, paying in cash, or lack of familiarity with the vehicle’s operations. (U//FOUO) Commercial motor vehicles or heavy equipment being operated erratically, at unusual times, or in unusual locations, particularly in heavy pedestrian areas. (U//FOUO) Attempts to infiltrate closed areas where traffic usually moves, but where crowds are gathered, such as for street festivals or farmers’ markets. (U//FOUO) A vehicle operator’s apparent unfamiliarity with commercial motor vehicle or heavy equipment operation (unable to back up; trouble with shifting; poor lane tracking; unfamiliarity with basic vehicle mechanics such as air brake operations, slack adjusters, fifth wheel operations, Jake brakes, engine type, or location of fire extinguishers and other emergency equipment).